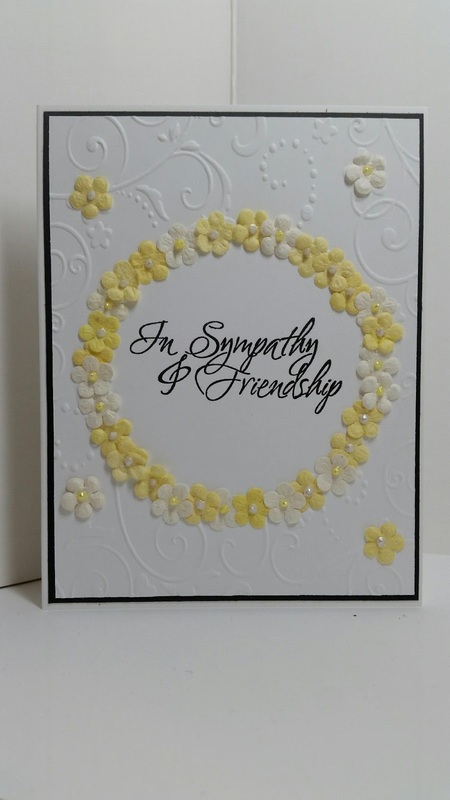 My supply of sympathy cards is quite depleted so I thought I would use this week's challenge sketch to create something simple and yet soothing using a yellow and white color scheme. This card began with an embossed layer by M'press with a round frame in the middle, I then added a stamped greeting by MSE and surrounded it with varied yellow flowers by Prima. I put Ranger liquid pearls in the center of each flower. I decided on an additional thin layer of black behind the white embossing to help ground the black lettering in the center. 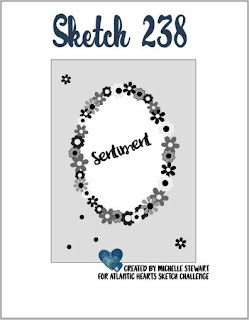 Hope you'll play along with us as the Atlantic Hearts Sketch Challenge. What a sweet card, so beautiful. Thanks for playing along with Atlantic Hearts Sketch Challenge (AHSC). Gorgeous card! The embossing and sweet wreath of flowers are so pretty and are sure to bring comfort. Thanks so much for playing along at ASHC. What a lovely calming card for sure...a sympathy card surely would make anyone feel comfort. Thanks for joining with us here at AHSC this week. What a beautiful card... the colors are very soothing... thanks so much for playing along with Atlantic Hearts! Since I was a child I have always loved arts and crafts. I find the time spent creating cards and paper crafts to be relaxing and enjoyable. This blog showcases many of the cards I create for challenges across the internet. Occasionally I sell them at craft shows and to friends and family. If you are interested in something please send me a message.